What is Minori Motivational Climate Survey? Diagnosis Based on the Motivation Theory. This is developed by Dr. Nair of University of Texas based on the Vroom-Porter-Lawler’s Expectancy Theory of Motivation. 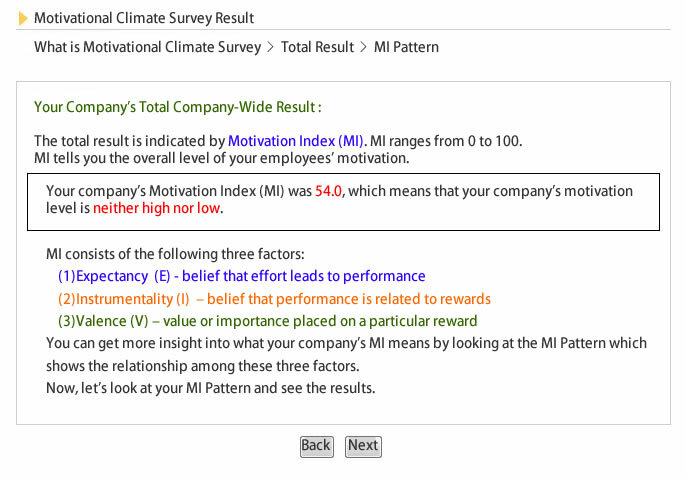 Minori Motivational Climate Survey is developed by Dr. Nair of University of Texas and is a Web-based survey to diagnose the level of motivation of your company based on the Vroom-Porte=Lawler’s Expectancy Theory of Motivation. Minori Management Research Institute is offering this service in association with the Leadership Center of University of Texas at Dallas. You can get the result quickly because the data collection is done on the Web. Your employees will receive a short questionnaire with 20 selected questions on the Web. The calculations are also done on the Web; therefore it is so fast to get the result. Your organization’s climate is analyzed. You can get the results of the analysis quickly. The responses of your employees are statistically processed, and you can get the following results. MI gives you an idea of the overall level of motivation of your company. MI is calculated based on the three factors; (E), (I) and (V). The calculation result is graded in five levels: Very High, High, Neither High Nor Low, Low and Very Low. 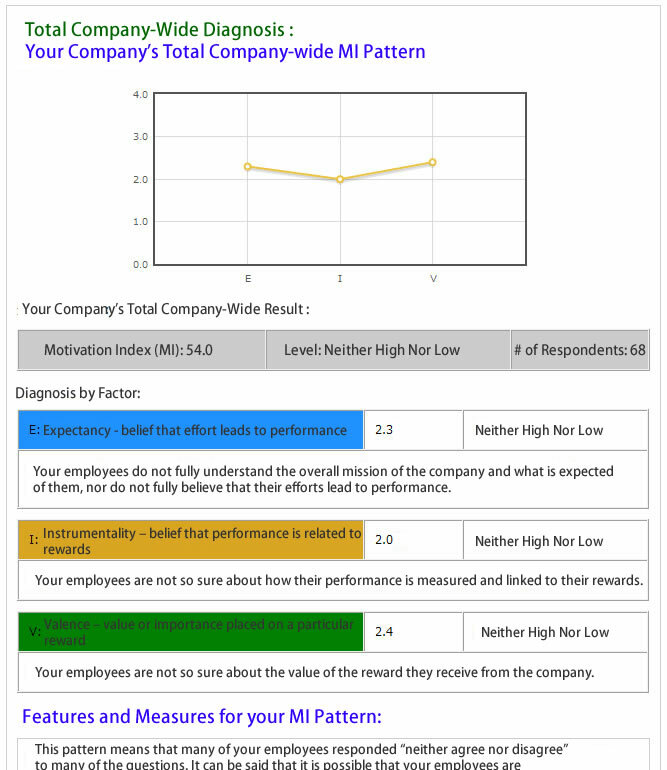 MI Pattern, which shows the company-wide levels of (E), (I), (V) and their relationships, represents unique challenges and opportunities of your company. 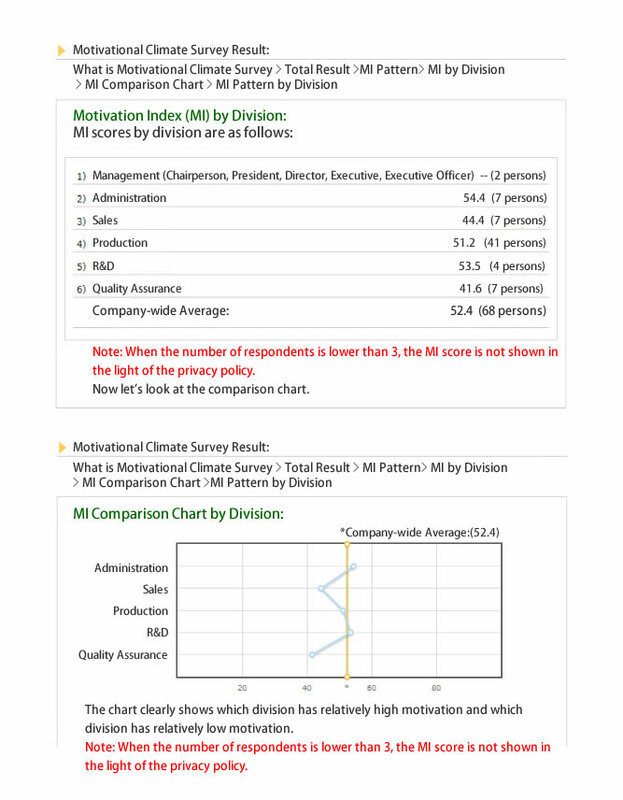 The list of MI by division and the comparison chart are shown here. You can see the differences of the levels of motivation by division at a glance. Optionally, you can see the MI Patterns and their unique challenges and opportunities of the divisions you additionally asked to analyze.